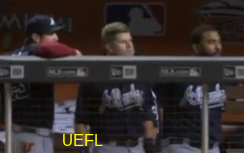 HP Umpire Adam Hamari ejected Braves LF Matt Kemp and Interim Manager Brian Snitker for arguing a strike two call in the top of the 3rd inning of the Braves-Marlins game. With two out and the bases loaded, Braves batter Nick Markakis took a 3-1 slider from Marlins pitcher Andrew Cashner for a called second strike. Replays indicate the pitch was located over the outer edge of home plate and at the midpoint (px -.891, pz 3.557 [sz_top 3.670]), the call was correct. At the time of the ejection, the Marlins were leading, 2-1. The Braves ultimately won the contest, 3-2. This is Adam Hamari (78)'s third, fourth ejection of the 2016 MLB regular season. Adam Hamari now has 18 points in the UEFL Standings (8 Previous + 2*[3 AAA + 2 Correct Call] = 18). Crew Chief Jeff Nelson now has 9 points in Crew Division (7 Previous + 2*[1 Correct Call] = 9). This is the 178th and 179th ejection report of the 2016 regular season. This is the 84th player ejection of 2016. Prior to ejection, Kemp was 0-1 (SO) in the contest. This is the 72nd Manager ejection of 2016. This is Atlanta's 9/10th ejection of 2016, 1st in the NL East (ATL 10; MIA 9; NYM 5; WAS 4; PHI 1). This is Matt Kemp's first ejection since June 23, 2015 (Jim Reynolds; QOC = Y-C [Check Swing]). This is Brian Snitker's 3rd ejection of 2016, 1st since July 19 (Angel Hernandez; QOC = Y [Balk]). This is Adam Hamari's first ejection since May 28, 2016 (Terry Collins; QOC = U [USC-NEC]). Wrap: Atlanta Braves vs. Miami Marlins, 9/23/16 | Video available via "read more."